Yarn choices for this project can vary in weight but should follow the requirements listed in the Felting Tips. 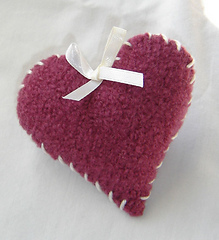 A knitted square that has been knit in stockinette stitch is first felted then cut into two heart shapes. 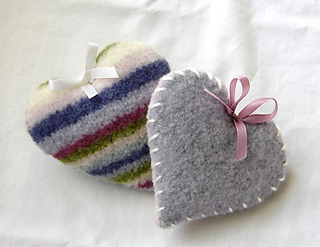 The felted hearts are joined together and filled with rice and herbal tea. 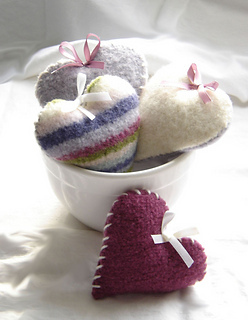 The finished heart can be heated to create a cozy hand warmer, a wrist rest while computer mousing, a spot muscle relaxer, or just a pretty decorative touch for Valentine’s Day.